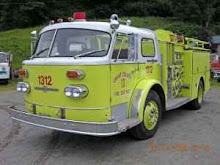 Unofficial (but reliable) word has reached me that according to the premier and longtime Historian of the Tacoma Fire Department, Ralph Decker, my engine's original home was with Tacoma Station 2, as Engine Co. #2, from the time of its delivery in 1970 until it was replaced in 1980 with a new Mack CF pumper. It then spent the next seven years at Station 10 until it was again replaced with a new pumper, this time a 1987 Thibault. My engine then moved to reserve status for a few years before Tacoma sold it to Grant County Fire District #5. Ironically, if you have been reading along so far, you'll note that Station 2 was the only other fire station other than Station 10 that we stopped at when passing through Tacoma on the pick-up trip. Well, I guess we did a photo-op drive-by at the old Station 8, but it is now closed and we didn't hover for long... doesn't quite count. I seem to have apparently had an inkling on this, though.... when I first hedged on the blog name, on just the 2nd post of this blog, I used Engine 2 as an example alternative. Ding ding ding! Where's my prize? Oh wait, I already own it. Yeah! So.... this is the first new post on the blog after moving it to its new location (formerly this was the "Engine 10 Project"). I missed the Woodland WA Pump-In arranged by SPAAMFAA this past Saturday, but had a pre-arranged father-and-son camping trip on that weekend with my 9-year-old. The fire engine will need love for a while, but my children only grow up once. Skipping the trip with my kid was therefore never even on the radar. I hope to take Engine 2 to some of these future events when conflicts are not a problem, and sponge up the knowledge that other participants are sure to offer. I need all the help I can get. Due to Summer winding slowly down, and other financial obligations screaming for attention, it is unlikely that there will be any major amount of regular activity on Engine 2 in the near term. However, of course, when there is, it will be noted here. The only significant thing done in the past 24 hours was the removal of the decals from the cab marking it as GCFD13's Engine "1312" and the removal of the "13" from the doors. The actual lettering, "GRANT COUNTY FIRE DISTRICT" was painted onto the doors by previous owner GCFD5 and will need to be buffed off. Sorry for the boring update. Updates on our baby are never boring. I hope you don't mind if I call her "Our baby" as I have some (small) personal stake in her even if it is only that it is my fault you even found her in the first place! I love her! I know she is yours but you know I live vicariously through you! I intend to help financially with her restoration, as I am able. It won't be much but I really want to help.